Gemma is a freelance theatre director who specialises in new writing. Her passion is dynamic, contemporary theatre with ensemble at heart. She seeks to collaborate with underrepresented artists, in particular women and artists from working-class backgrounds. Her aim is to be at the forefront of innovative theatrical experiences that provoke, empower and entertain. Currently Gemma is developing Passing by Indigo Griffiths, a new play exploring the cultural phenomena of racial passing. Passing won the Theatre Royal Haymarket Masterclass Trust’s Pitch Your Play competition 2018 and in November Gemma directed a staged reading at the Theatre Royal Haymarket. Gemma’s directing credits include Passing (Theatre Royal Haymarket/Royal Academy of Dramatic Arts/The Bunker Theatre/Pleasance Theatre), My Dad’s Blind (Winner of Best Production, Dublin Fringe Festival 2018); the European premiere of Gracie (Finborough Theatre); Grimm: An Untold Tale (Underbelly, the Edinburgh Fringe Festival) and Tender Napalm (Karamel Club Theatre, Mountview Academy of Theatre Arts). Assistant directing credits includes Sam Hodges on the world premiere and revival of Howard Brenton’s The Shadow Factory (Nuffield Southampton Theatres); Daniel Goldman on Thebes Land (Arcola Theatre); David Mercatali on Tonight With Donny Stixx (The Bunker Theatre) and Matt Cowart on Lockhart: A New Southern Gothic Musical (Bernie Grant Arts Centre). Gemma is currently Associate Director on STOP AND SEARCH at the Arcola Theatre. Gemma also works as a drama facilitator. She has lead workshops with emerging artists at the Mono Box, the Oxford School of Speech and Drama, Mountview Academy of Theatre Arts, Peer Productions, the Nuffield Southampton Theatres and the Globe Young Players. 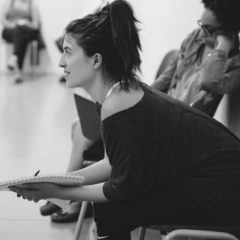 From 2016-2018 Gemma was the Assistant Director for the Mono Box where she regularly supported movement director Polly Bennett (People Places and Things) and actress Joan Iyiola (The Duchess of Mali, RSC) with industry lead workshops. Gemma co-founded PLAYSTART, the Mono Box’s annual showcase of new writing and her spare time Gemma continues to support the Mono Box. In 2017 and 2018 Gemma supported Jill Green Casting with auditions for the National Theatre’s UK tour of War Horse. In the summer of 2017 Gemma shadowed War Horse rehearsals in London and Canterbury. Gemma is listed on the National Theatre’s Staff Director’s Database.